To begin the game, start by selecting a game facilitator. Each player will take a turn rolling the dice. The player with the highest numbered roll will become the game facilitator. This facilitator is charged with reading the rules of the game out loud and making sure the game is played correctly, including all judgment calls. Each player will choose a colored pawn, then place their piece on the start circle. The game facilitator will roll the dice to begin the game. After the dice is rolled, the facilitator will pull a card from the pile. The number on the dice dictates which suite on the card to play. If a joker is pulled, the player can choose any suite. If the roller has indeed experienced the subject in question, they will answer “yes”. All other game players now have the opportunity to ask one or two questions about their experience. For example: “Who were you with at the time?”, “How old were you when you did this?”, “What year?” or simply “tell us about the experience”. If the questions are answered with certainty and clarity, the player can move forward on the board (the amount of spaces they rolled). If the player answers “no” then they do not move forward and the play moves to the next player. If the other game players unanimously agree that the roller is bluffing about their experience, or the roller declines to answer the question, then he/she must stay put. The first player to land in the Finish circle is deemed the winner. Keep in mind, the player must roll an exact number to land in this circle, they can’t overshoot the circle. 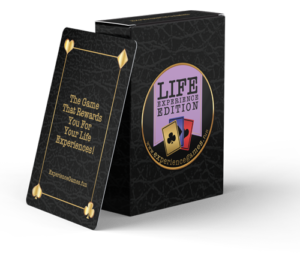 The goal of the game is to answer all four questions on a single card and share your experiences with other players. Deal all the cards equally to all the players. Whoever gets the Joker card will start the play of the game and is the card Dealer. The Dealer will keep that Joker card. It counts as an Answered Card. Each player will attempt to answer all four questions on the card. At any time any other player can ask that player questions about their answers. If all the other players agree that the the player is bluffing about their answer then that player loses their card. If a player can answer all four questions on their card then they get to keep that card. The winner of the game is the player with the most Answered Cards. All cards that are unanswered should be placed in a new Discarded pile in the center of the play table. Players play until all the dealt cards are gone. The player with the most Answered Cards is the winner. In case of a tie, the tied players should use the Discarded card and play each other. They can continue to play until all the Discarded Cards are gone. The player with the most Answered Cards is then the Winner. GAME Winners … post YOUR winning photo to our Winner’s gallery page. 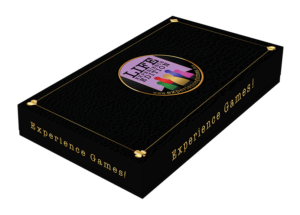 Winners will be entered in our Experience Game contests and will receive discounts on the Experience Games Store.